into World War I. 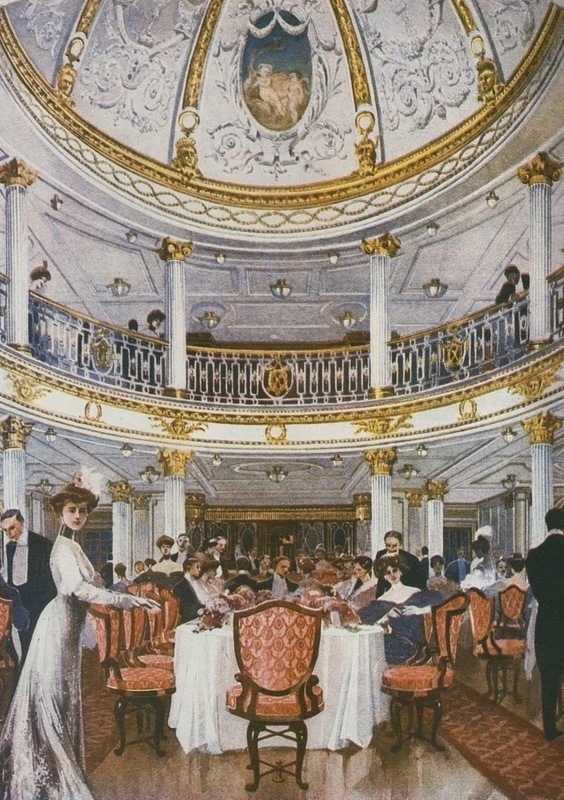 However, what I was unaware of until researching cruise ships for my protagonist to get to the States from England in 1914 was how luxurious the ship was. Every bit as comfortable and regal as the Titanic, the Cunard Line touted the Lusitania as able to make the trip from Liverpool to New York City in four days. Common to all liners of the day, first, second, and third class passengers were strictly segregated, each class being assigned its own space on the ship. 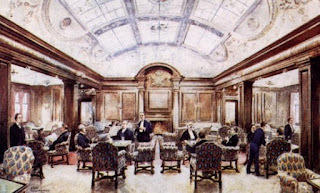 The Cunard Line prided themselves on passenger satisfaction.The ship even accommodated the many emigrants who traveled on the ship with larger dining rooms and comfortable sleeping facilities. The ship's first class dining room was the most elegant of the public rooms, sporting a crowned ceiling and decorated in neo-classic Louis XVI style. White and gilt carved mahogany panels lined the walls, supported by elaborate columns. The furniture was bolted to the floor for safety measures in lieu of the waves of the North Atlantic. Unique to the Lusitania was a veranda cafe with walls which could be opened up to the deck in warmer weather, which actually proved to be infrequent due to the North Atlantic's harsher weather. When the Lusitania was built, the British financed it with the understanding that it could be converted to an armed merchant cruiser. Special compartments were designed to carry arms and ammunition. In the fall of 1914 the cruise passenger business fell off considerable due to the escalating war in Europe, but the Lusitania continued to run. bow sinking the vessel with 1962 people aboard in about 18 minutes. The crew scrambled to launch the lifeboats, but the severe list of the ship allowed them to only get 6 out of 48 launched successfully. Eleven hundred and ninety one lost their lives, most due to hypothermia and drowning. A second explosion sent the Lusitania to the bottom of the sea. A tragic end to a beautiful ship thrusting the United States into a terrible war. Thanks for this fascinating article, Golden! I'd heard of the Lusitania, of course, but that was about all. I really enjoyed learning more about this famous ship. Wow. Interesting! The lovely images actually reminded me of Titanic (from the movie) of how the different social classes have different entertaining and dining halls. Thanks!